I'm a huge believer in plan C. Let me explain. Usually people have plan A for action and if that fails, there's plan B. But if both fail, many give up and just stay put, miserable, blaming bad luck. For me plan C is not just another plan, but it's a cunning mid-way scheme to tackle the problem or roadblock with creativity and change of perspective. Depending on how you think of it, it can be a compromise, or finding a proverbial or symbolical back door, window, chimney or a tiny crack behind a cupboard to squeeze through towards the direction you want to go. 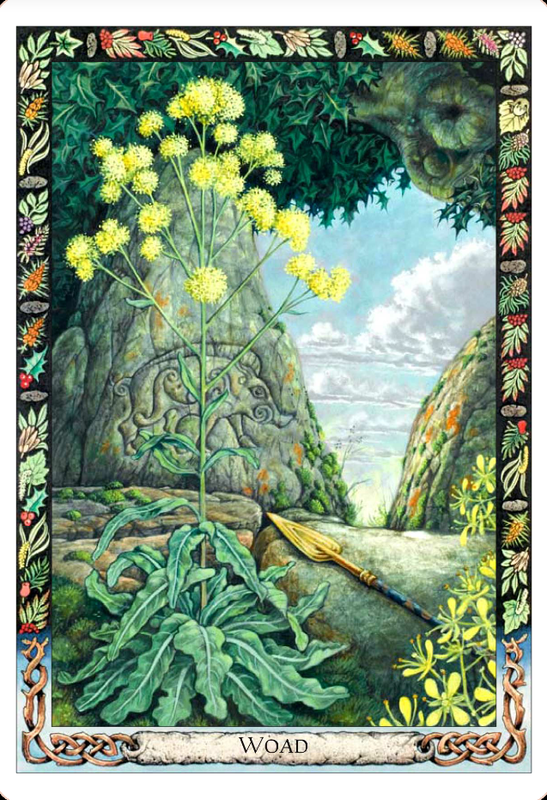 My today's Druid Oracle card was Woad reversed. It's a tall plant with small yellow flowers and it was used for dying fabric in the olden days of Celtic Druids - in particular the war cloths of the Celtic warriors. The upright meaning of the card is freedom and warriorship (fighting for your freedom and passions, going after your goals), but the reversed meaning is as follows: instead of seeking freedom from something, why not seek freedom for something? The very things you think are limiting you, might actually be working for your benefit, if you find goals that make your heart sing and rearrange your life to allow you to pursue these goals within what is currently available to you. An example: I relocated to Australia years ago from Northern Europe because I was completely done with the gloomy climate and the equally gloomy economic situation. I often receive questions from friends and strangers alike, asking how they could get to Australia, because it's their dream, too. When they realise relocation takes a lot of time, money, tenacity and skills and perseverance to tackle bureaucracy, all of them have given up - at first. However, some explore what's their desire a bit further. For some, it's new experiences and better job opportunities. To others, it's life in the sun, close to the sea. One friend of mine has moved to London for job purposes and is doing fine, and another moved to a Mediterranean island, and is doing equally fine. Both changes were relatively easy and inexpensive to undertake within the European Union (no visa hassle), once they realised what was the real desire. It wasn't Australia. It was something that could be obtained elsewhere, with better chances. Another example: I work in an office in an area that is not particularly inspiring - truth to be told, it's the opposite of inspiring. I've felt for years I could achieve much more if I just found a better suited role, a more creative one. I've sent countless applications, rewritten my resume a number of times, tried networking, tried pretty much everything any business success guide recommends, with no luck. Partly, if not mostly, my success was hindered by - - - myself. I'm too comfortable with my current salary and very flexible hours, and have not wanted to sacrifice those by trading off to something more rigid and stressful. After years of job hunt, I've understood there is no job on earth that would fulfil all my needs: no job - other than working for myself - can offer freedom to do whatever interests me at a time that suits me, and remain intriguing and inspiring day after day. It took a lot of soul searching and tarot readings and a complete change of perspective to see that my current job is a necessary sacrifice to achieve the lifestyle I want: a comfortable financial position, flexibility, a chance to do my PhD without financial worries, a chance to run my own creative projects like this blog, a chance to set up a rewarding side business without stressing my head off about the initial lack of income. The moral of the story is: what is it you truly desire? You might think you need a new job. But would it actually make you happier? Yes, you might get rid of some nasty people you don't need around, or release yourself from mind-numbing tasks. But the fact remains that many (if not most) of today's jobs just are by nature boring, repetitive and also come with annoying colleagues. There is no heaven or panacea at the job markets, I suspect. So, ask yourself: what is it that would make you happy? A chance to be more autonomous? Have clearer purpose? Have more time for yourself or your family? A chance to self-develop? Experience something new? Rid yourself of a particular person? The next step is to devise plan C to achieve what you desire. If you're unhappy with your job and can't get another one, is it possible to rearrange or reallocate some tasks? Transfer to another department, office or city? Go on a training course or take study leave and eventually leverage yourself to a new role? Momentarily rely on your partner's income and/or your savings while you take leave without pay or stress leave to go on full time job hunt? Or, could you move to a cheaper location to manage with smaller income, if you need to take a pay cut with a new, lower-level or part-time job? Can you take leave without pay, rent your pad and go on a couple of months' holiday in a cheaper country to regain your energy and find inspiration? Move back home to share the living costs with your folks? Or find elements to be grateful for and make them work for your benefit in your current situation? A 180 degree turn in your attitude to see only the benefits and none of the negatives? A problem I personally have is the tendency to take on too much: obligations, tasks and projects in and out of work. The tarot card 10 Wands picks this perfectly by usually depicting a person carrying a heavy bundle of branches. At some stage picking each one of them felt doable and maybe even a good idea, but too much is too much. Getting this card in a reading is a clear reminder that now it's time to declutter everything that is not absolutely necessary. Any work task that can be reallocated, should be. Any duty or household chore that could be done by someone else, should be. Any personal project that's mainly a drag now, should be left alone for a while, if not dropped altogether. One avenue people often overlook is the support of friends. If you hope to change jobs, do you already know people from that field? If not, how could you find them? Talking with people who work in your desired field can also reveal is that what you truly want - does it match your expectations? Are there any associations, networking circles or just friends of friends you could connect with? My experience is that nearly everyone is happy to meet for coffee to give advice, if that's the only thing you ask. Asking someone else to find a job is a bit too much, but asking tips, information about skills requirements and networking chances is another matter altogether. and the majority of people are more than happy to help, because most of us enjoy seeing someone progress and reach their dreams. Based on my own experience and people around me, the biggest obstacle between you and a change for better is the blockage caused by stress, which in turn causes lack of perspective, lack of fresh new ideas and lack of energy to execute any plan, no matter if it's A or C. Hence, the most essential task to start with is to release stress, on an ongoing basis. I strongly recommend doing sports you enjoy (anything from swimming or gentle walks in the park to combat sports or full-on cardio) and/or spending time in nature - either in your back yard, garden or a nearby park, or in the wilderness. Regularly. Preferably multiple times per week. If you think this is waste of time or an additional luxury you can't do... think again. It's the first brick of your golden road to success and your road can't be built, if you, the builder, are too exhausted to lift a finger or form a proper sentence! I've seen this work with plenty of people, including myself. I would still be in my personal pit of misery had I not relied on sports and nature - in addition to tarot - to gain extra energy to actually see the positives of my current situation. It's been scientifically proven that natural settings and any form of exercise reduce stress immensely and are the natural release systems to rid your body of stress hormones, the "fight or flight" chemicals we all incur every day. Half an hour per day in nature can make all the difference, because it allows your body to relax and your mind wander freely, to explore and find potential answers. If you combine the "nature or sports treatments" with exploring your feelings and mindset with tarot, I can almost guarantee your life's direction and chances will start looking much, much better! How to be more satisfied with life? What I think would make me happy but in reality, wouldn't? How to obtain happiness within my current situation? What to change to have more happiness? What to accept (can't change right now)? What should be my short term goal in finding happiness? What should be my long term goal in finding happiness? What is the most urgent thing to do for better well-being?